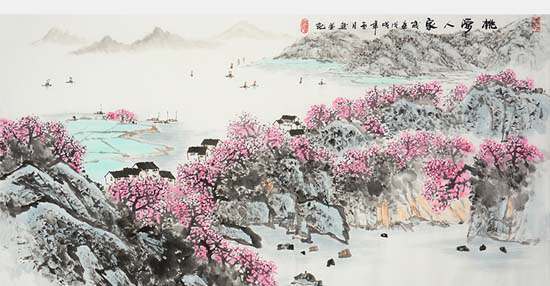 桃 源 望 断 无 寻 处。Peach Blossom Land ideal beyond the sight. 可 堪 孤 馆 闭 春 寒，Shut up in a lonely inn, can I bear the cold spring? 杜 鹃 声 里 斜 阳 暮。I hear at lengthening sunset homebound cuckoos sing. 砌 成 此 恨 无 重 数。Nostalgic thoughts uncounted assail me oft in a host. 郴 江 幸 自 绕 郴 山， The lonely river flows around the lonely hill. 为 谁 流 下 潇 湘 去。Why should it southward flow, leaving me sad and ill?